I got a copy of a builder for Philadelphia ransomware from an underground forum. When I ran it, this builder appeared to be clean. 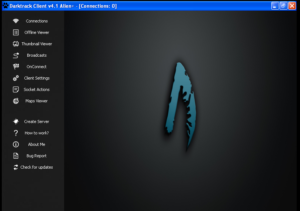 The builder came as an AutoIT-wrapped file with a lot of support files and also a copy of UPX. 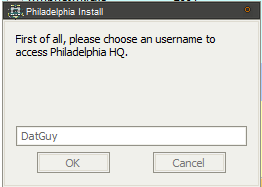 Running the builder resulted in a fancy splash screen and then I was prompted to create an account and password with “Philadelphia Headquarter”. Once this was done, I was able to finish installation. I should note that this particular copy of the builder was said to be cracked, and I noticed no network traffic related to this user creation process, so I suppose this is because of the crack or perhaps this is a local account set up on the Philadelphia builder. Congratulations for buying the latest word in ransomware! We wish you great incomes. 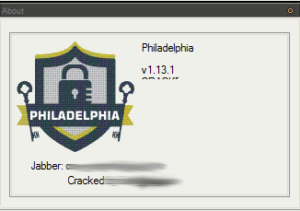 Philadelphia is a revolutionary product that brings the ease of use for the ransomware world. No more complicated server settings, no more monthly fees, no more source code compilation. Philadelphia takes all the hard work and presents to you a panel where you can take the control onto your hands. We really recommend you to read every topic of this help file before your first adventure with Philadelphia. As a revolutionary product, Philadelphia includes many new features and terms that aren’t seen in other products, which makes some early instructions needed. We are the folks at The_Rainmaker Labs. Perhaps you got to know us through our previous product, Stampado, a simple and easy to use ransomware that got in the news (Softpedia, Forbes, WSJ and a lot more) for bringing advanced features for just $39. Yes, we like to play with security, as you might have guessed. With Stampado, we could be able to understand what ransomware buyers seek on new products. After 1 and half month of “experiment”, we bring Philadelphia, to supply to all needs. You can contact us easily if something goes wrong (or too good, we love to hear stories from our clients when they make big bucks with our products) by clicking “Support” on the Philadelphia window. Warning: at the time of Stampado, several scammers appeared pretending to be us and selling fake copies of our products, fooling several people. Be careful. We don’t have 3rd-party sellers, Twitter nor email account. The only way to contact us is through Jabber (the two accounts on the “Support”). We are not here to tell you guys what to do, but what NOT to do. First of all, do not waste your time trying to decrypt the files. As the ransomware sends the crypt key to a bridge and the bridge will only give it once a payment is sent, it’s impossible. Also, there is no way to do some spoof and pretend a payment, as the verification happens on the server where the bridge is hosted, and not on the client machine. Secondly, never delete the Philadelphia files on a infected machine (or make it impossible to run). There are many sensitive data that, if lost, the user files are really gone forever. Also, the Philadelphia agent executable file is the only hope for the victim to recover their files, as it’s the only software capable of accessing and interpreting the bridge responses. If the user cannot open it, then there will be no way for recovering the files. With our previous product, Stampado, our initial objective was to always keep it FUD. However, with the bigger sales, it wasn’t possible due to many users (not victims) sending it to online scanners such as Google’s VirusTotal. VirusTotal on the past had an option not to distribute. Its targets were companies that wanted to scan securely private files and did not want it distributed. However, as you can imagine, most of the users of this option were malware developers. Therefore, in 2008, this option was removed (see http://blog.hispasec.com/virustotal/28/). Nowadays, VirusTotal works this way: once a file is uploaded to scan, if at least one of the antivirus solutions on the site detect something harmful on the file (even a generic detection (Gen/HEUR) or even a false positive), all the other AV solutions that didn’t detect it receive a sample of the file with the entire report (PE data, antivirus detections etc. ), so they can start detecting items as well. This information was taken entirely from their FAQ (https://virustotal.com/pt/faq/, section “Including new antivirus solutions and tools in VirusTotal”, third paragraph). This way, by sending a malware to VirusTotal with small detection rates, you ensure that it will be highly detectable in a few days (or even hours) and will need to spend money on crypters. Definitively, you do not deserve congratulations for that. During our development, we used VirusCheckMate.com and Scan4You.net and never had any problems with these ones. However if you can’t pay (10 cents a scan), there are free alternatives, such as NoDistribute.com. Be aware that we aren’t sure if NoDistribute really does not distribute. This information is not valid only for Philadelphia, but to ALL hacking tools, exploits and malwares you’ll ever find. An agent is the malware itself, the executable file you’ll need to spread to your victims. 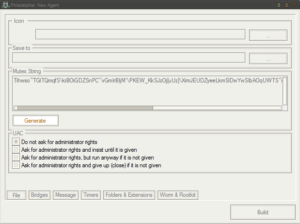 Its work is better explained on the “Agent” subtopic but it will basically generate a crypt key, use it to encrypt the user files (depending on the folders and extensions you choose when generating the agent), send this key to the bridge and ask for the ransom. A bridge is nothing more than a PHP script that can be hosted in likely any server without the need of a database. The bridge usesflat files a (it’s a PHP script that uses just files as data storage, so editing it is not recommended – nor needed – and some SQL engine is NOT needed). Its work is better explained on its subtopic, but it will basically store the victim’s crypt keys, give important info (i.e. : an unique ID per victim, the demanded ransom and also choose a bitcoin wallet for the victim) and provide the victims data for the headquarter. It’s usual. One week before launching Philadelphia, we created and spread a modified version that cointained a proposital security flaw that allowed the researcher to easily see the password. We used this executable and infected several machines. 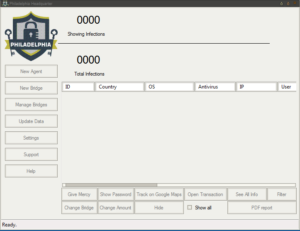 Our main target – Fabian Wosar from EmsiSoft – has took the bait and published the first decrypter. However he didn’t see the security flaw (turns out that he’s not as good as he tells to be) and published just a bruteforce-based decrypter that needed the victim to tell two versions (one original and one encrypted) of the same file. We don’t need to say, but bruteforce is not the best option, mainly when a deadline is threatening your files and you know that bruteforce can take millenniums. 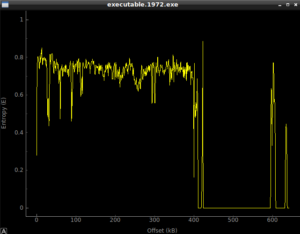 Anyway, Fabian decrypter did not work in any way, nor in bruteforce, and we don’t know why, but who cares? Keep in mind that, as the encryption key is kept out of the victim machine, brute force is really the only option. While, in a side, there is nothing we can do about it (and any ransomware or encryption algorithm is vulnerable to it), in other side, there is also nothing to grant that the user is going to see the files back. So this is really something to ignore. In other words, it is impossible to decrypt Philadelphia. There’s a very long mutex used to ensure only a single instance is running, with option to generate a random mutex or allow manual entry. was the default when I first ran this sample. There are various options related to UAC, either to not ask for admin rights or to ask for admin rights with varying degrees of effort. The ransomware should run just fine on a victim’s machine without having admin rights, however it appears that it would need admin rights in order to access certain folders such as other users’ folders on the same machine. To decrypt your files you will need to buy the secret key from us. We are the only on the world who can provide this for you. Pay the ransom, in bitcoins, in the amount and wallet below. You can use LocalBitcoins.com to buy bitcoins. What’s interesting here is that the ransomware controller can specify a default ransom note, and then can also specify a custom ransom note for any one of a large number of other locales, based on the character set in use on the victim’s machine. The “Timers” section is actually pretty interesting also. Philadelphia ransomware comes with a feature called “Russian Roulette” where a random file on the victim’s machine will be deleted based on a timer if payment is not yet made. This part of the Agent panel is where the settings for this feature can be specified. The default settings are to delete one random file every six hours, checking the bridge for payment every 60 seconds. A final deadline can also be specified, which by default is four days. At the end of this four day period, there is the option to delete all of the victim’s encrypted files and also to delete their encryption key from the bridge to remove the option of using it to decrypt the victim’s files. It appears that this also allows the ransomware controller to specify which folders to attack first. Based on this, it looks like the ransomware will search through fixed drives first, then removable (likely USB) drives next, followed by network drives. Note also that Philadelphia is not destructive in the sense that it does not target system files or executable files. I’ve seen ransomware that does this, and this is pretty stupid if you’re actually trying to get a ransom payment (e.g., if you encrypt the users system and browser files, how are they going to access your payment site to send you money?). The final section, “Worm & Rootkit”, is where one can add features such as USB infect, network spreading and packing (via UPX) to the Agent. There’s also an option to drop the ransom note as a text file on the victim’s desktop and in their documents folder. The default process name for the Agent is “Isass.exe” (in case the font doesn’t make it clear, that’s a capital I and not an l) and will extract itself to the %APPDATA% folder unless otherwise specified. There are options to hide the extracted files and also to melt (delete the initial malware executable upon execution). The ransomware can be set as an “unkillable” process and can also have a delay set on it to wait a specified number of minutes before executing its malicious functionality. Finally, there’s an option to show the ransom note/window before encrypting files — not sure why you’d want to do that, actually. I went ahead and built a test Agent and Bridge. Bridge creation is very simple — just specify a bridge name, password and folder to use and the PHP file will be generated for one to put on the bridge server (whatever form it takes). Here we can see all of the settings that we entered before, such as the bridge information, various options such as the USB spreader, and the list of extensions to target. Speaking of the USB spreader, what I saw is that the ransomware drops an autorun.inf file that it drops in the root directory of those drives. Pretty easy to read it, but the p argument appears to be the action taken on the flat file; OS info shows the installed OS of the victim; user is the username of the victim on the infected machine; country is self explanatory; av appears to indicate the antivirus software (if any); locate shows character encoding on the victim machine; and finally the ucd argument appears to be the key. I’m not sure what the “-False” at the end indicates. One cool thing here is that you can see all of the wallets used. Looking these up don’t reveal any transactions, though. We can see here that the ‘ucd’ argument refers to the decryption key, as mentioned earlier. One can also see all the information about the victim’s machine being sent (OS version, location, character encoding, user name, and then transaction information about payments. This refers to the functionality in the ransomware that will help account for unforeseen transaction (or other) fees that might dip into the payment made by the victim and still count this payment as valid. For example, if you set a 10% tolerance, and the victim must pay 1 BTC, you would then count as paid a payment that was 0.95 BTC net of fees. 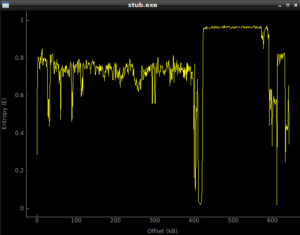 – Digging more into the Delph1.dat file. I have very little experience with AutoIT, but I would really like to see what else can be decoded from this file since this appears to be the actual script that handles the ransomware functionality in the client. – Looking through the bridge file some more to identify good ways to crawl or otherwise find these bridge files on compromised (or malicious) servers. description = "Detects Philadelphia Client based on test build"
$phila0 = "give up fabian"
$phila1 = "How to recover my files.txt"
$phila3 = "struct;align 4;dword FileAttributes;uint64 CreationTime;uint64 LastAccessTime;uint64 LastWriteTime;"
$phila15 = "Wallet for Sending Bitcoins"
$phila16 = "Thanks! Please wait while we decrypt your files. Do NOT turn off your machine." $phila17 = "Paste here the transaction ID to get your files back:"